The pharmaceutical industry is focused on the most emerging branch in pharmaceutical sciences known as“ Pharmaceutical nanotechnology ”. The increasing prevalence of chronic diseases/disorder and development of the healthcare infrastructure are promoting the adoption of the novel medicine known as nanomedicine for better efficacy and improved patient outcome. Nanomedicine works on same principle of nanotechnology, as the materials at nanoscale level possess unique characteristics as compared to macroscopic level. Nanomedicine has a multidisciplinary nature involving notions and techniques from biology, chemistry, and physics. Nanotechnology provides exceptional benefits when applied to medical devices and pharmaceuticals. Furthermore, the patent cliff/expirations has the enabled the pharmaceutical companies to adopt new business strategies. Many blockbuster drugs are going off-patent but the introduction of nanotechnology in medicines has revolutionized the pharmaceutical industry. With the advancement in the Nano pharmaceutical industry, the number of patent filings has dramatically increased. Pharmaceutical companies have developed new strategies & techniques to re-patent drugs which are on the way to expiration by modifying them with the help of nanotechnology. Nanodrugs offers a promising potential in terms of revenue growth. The purpose of this study is to gain a holistic view of the nanopharmaceutical drugs market in terms of various influencing factors such as recent trends, regulatory requirements, and technological advancements of the market. The scope of this report constitutes a detailed study of the drugs associated with the global nanopharmaceutical drugs market across different regions. The market has been segmented into ‘drug carrier type,’ ‘application,’ ‘distribution channel,’ and ‘regions.’ The report presents the reader with an opportunity to unlock comprehensive insights with respect to the market and helps in forming well-informed strategic decisions. The research uncovers some of the substantial parameters that must be taken into consideration before entering the market. 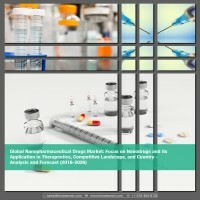 This research report aims at answering various aspects of the global nanopharmaceutical drugs market with the help of the key factors driving the market, restraints, and challenges that can inhibit the overall market growth and the current growth opportunities that are going to shape the future trajectory of the market expansion. The report includes an in-depth examination of the key players and recent developments taking place in this market. Moreover, the report includes chapters on market dynamics (market drivers, opportunities, and challenges) and industry analysis as well. The research study highlights the factors governing the industry attractiveness with Porter’s Five Forces for a comprehensive understanding of the global nanopharmaceutical drugs market. Moreover, the study includes detailed product mapping with further sub-segmentation in various countries, and in each sub-segment, the key market trends, list of the key companies, and the key strategies and developments have also been discussed. • How did the Nanopharmaceutical Drugs market evolve, and what is its scope in the future? • What are the major market drivers, challenges, and opportunities in the global Nanopharmaceutical Drugs market? • How will the influencing factors affect the industry attractiveness? • How nanopharmaceutical Drugs is superior that conventional drugs? • How will the investments by public and private companies and government organizations affect the global nanopharmaceutical drugs market? • What was the market size of the leading segments and sub-segments of the global nanopharmaceutical drugs market in 2017? • What will be the growth rate of the nanopharmaceutical drugs during the forecast period? • How will each segment of the global nanopharmaceutical drugs market grow during the forecast period, and what will be the revenue generated by each of the segments by the end of 2026? • Which drug carrier segment, application segment and distribution channel is expected to register the highest CAGR for the nanopharmaceutical drugs market? • What is the market size of nanopharmaceutical drugs in different countries of the world? • Which geographical region will contribute to the highest sales of nanopharmaceutical drugs? • Who are the key players in the nanopharmaceutical drugs market, and what are their contributions? The key players who have been contributing significantly to the nanopharmaceutical drugs market include Pfizer, Inc, AstraZeneca, Gilead Sciences, and Astellas Pharma Inc., Abbvie Inc., Amgen, Merck & Co., Inc., Hoffmann-La Roche AG., Teva Pharmaceuticals Industries Limited, Novartis AG, CELGENE CORPORATION, Sanofi S.A., JOHNSON & JOHNSON, AMAG Pharmaceuticals and Shire plc., among others. Big pharma companies rely on blockbuster drugs for revenue generation. The patent protection allows the pharma company to sell the drugs at high profit margin, for example the Pfizer’s drug known as Lipitor, accounts for about $13 bn of Pfizer's revenues. Many blockbuster drugs are going off patent, drug manufacturers are facing challenges to develop novel research and development strategies, involving miniaturization through various techniques including nanotechnology. The introduction of nanotechnology in medicines has revolutionized the pharmaceutical industry. With the advancement in the Nano pharmaceutical industry, the number of patent filings has dramatically increased. Pharmaceutical companies have developed new strategies & techniques to re-patent drugs which are on the way to expiration by modifying them with the help of nanotechnology. Nanodrugs offers a promising potential in terms of revenue growth. The nanopharmaceuticals have broach range of application and are used in imaging, diagnostics and therapeutics and possess full potential to dominate the pharmaceutical market. The introduction of nanomedicine will alter the landscape of medicine and will drastically improve a patient's quality of life and reduce healthcare costs. The purpose of this study is to gain a holistic view of the nanopharmaceutical drugs market in terms of various influencing factors, such as recent trends, regulatory requirements, and technological advancements of the market. The scope of this report constitutes a detailed study of the drugs associated with the global nanopharmaceutical drugs market across different regions. The market has been segmented into ‘drug carrier type,’ ‘application,’ ‘distribution channel,’ and ‘regions.’ The report presents the reader with an opportunity to unlock comprehensive insights with respect to the market and helps in forming well-informed strategic decisions. The research uncovers some of the substantial parameters that must be taken into consideration before entering the market. The global nanopharmaceutical drug market is valued $40.37 billion in 2017 and is expected to reach $79.29 billion by 2026. The major factor driving the growth of this market, are government and private funding to support the development of regenerative medicine, rising prevalence of chronic diseases and genetic disorders, increase in global healthcare expenditure, and rapid growth in the aging population. Further, the increasing insurance coverage and reimburesement policies in the developed markets such as the U.S., Japan, Germany, and the U.K. are the key drivers for the growth of the nanopharmaceutical drugs market. Moreover, among different therapeutic areas, the oncology therapeutic area dominated the global nanopharmaceutical drugs market in 2017. Nanoparticles offer an opportunity to introduce overall shift in cancer research. Many drug candidates are under clinical investigation and have the potential to be introduced in the market. Ideal nanomedicines should follow the regulatory pathway of approval and should have a modular design that can be easily scaled up for cGMP manufacturing and stored for a long time prior to use in patients. The Nanotechnology Characterization Laboratory and FDA works in collaboration to advance and review nanomedicine platform. On the basis of regions, the global nanopharmaceutical drugs market is segmented into North America, Europe, Asia-Pacific, and Rest-of-the-World (RoW). North America is the leading contributor to the global nanopharmaceutical drugs market and contributed 51.78% in terms of revenue respectively to the global market in 2017. However, Europe and Asia-Pacific is expected to grow at a significant CAGR between 5% to 7% in terms of revenue respectively, during the forecast period.